The James R. Browning U.S. 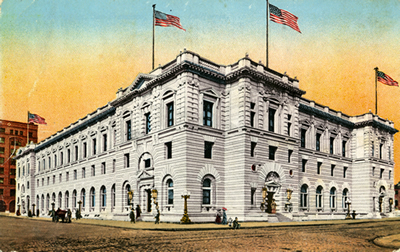 Courthouse, a National Historic Landmark, is located at the corner of Seventh and Mission Streets in San Francisco. The public entrance is 95 Seventh Street. Opened in 1905, this is considered one of America’s most beautiful public buildings. The court also offers free docent-led public tours of the historic courthouse on the Tuesdays listed below. The tours begin at 1 p.m. and last approximately 60 minutes. The tours include visiting the old post office lobby on the first floor, and available courtrooms. No reservations are required for individuals to join the public tour. Enter the building and meet the tour guide in the lobby. Each adult entering the building needs to pass through security screening and bring a photo ID. The court also welcomes group tours, if arranged in advance. For more information about future tours, or to arrange a hosted group tour, please submit an application at least 21 days in advance. If you have additional questions, call (415) 355-8090.